If you are looking for a quality diamond, an SI1 diamond would be a very wise choice. SI stands for Slightly Included, with inclusions being internal flaws within the diamond. 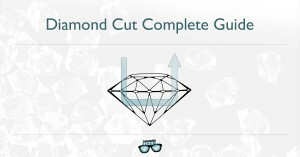 This guide will help you understand the advantages of SI1 diamonds along with some best practices to help you find the best SI1 diamond at the most reasonable price point. 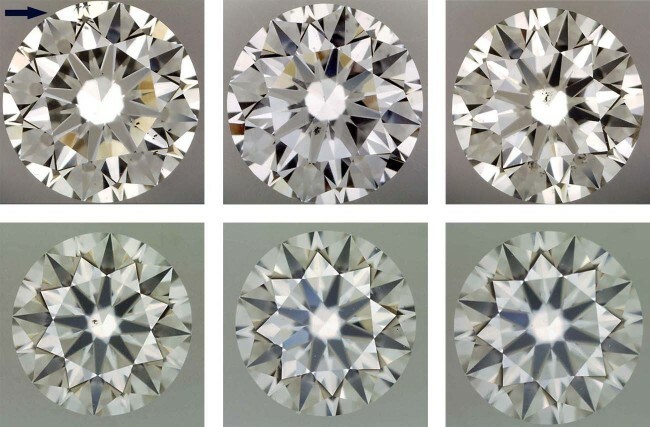 We don’t just have information for you, we have magnified photos to help demonstrate what we’re talking about, so that you can learn what to look for when purchasing your new SI1 diamond. 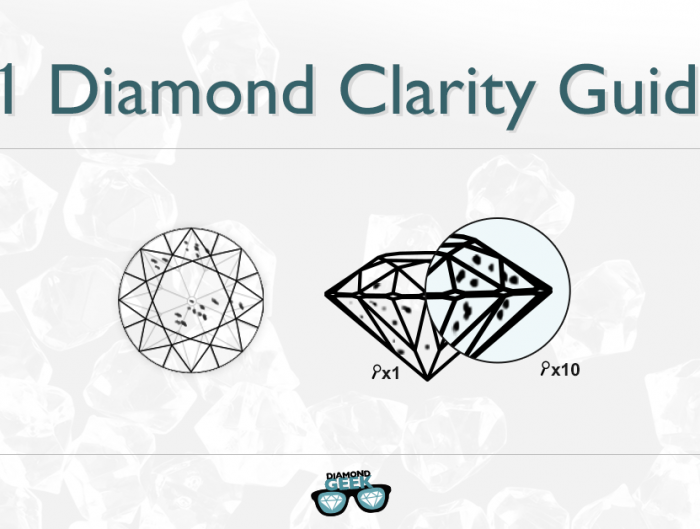 Diamond clarity measures the presence or absence of flaws or inclusions in a diamond. The less flaws that a diamond has, the higher its grade. The most common method for classifying gemological clarity is a grade by the Gemological Institute of America (GIA), which consists of 11 different clarity grades. 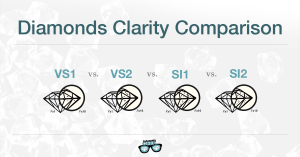 Below you can see the GIA’s diamond clarity rating scale. FL-IF: No internal flaws but IF will show very small surface flaws. VVS1 – VVS2: Contain tiny inclusions that are very difficult to detect under 10x magnification by a trained gemologist. VVS1 is slightly cleaner than VVS2. VS1-VS2: Minor inclusions visible under 10x magnification. I1-I3: Inclusions that are visible to the naked eye. The GIA is one of the two most accurate and professional gemological labs, the other being the American Gem Society (AGS). There are other respected gemological labs, some of which have higher requirements while others are not as strict. The grading of these other labs is not necessarily inaccurate or bad, but their systems tend to give diamonds a higher clarity grading in comparison to GIA and AGS. 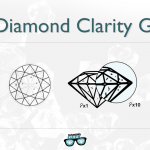 With the other labs you could think you’re getting a better diamond than you are, which is why I always recommend getting diamonds with GIA or AGS clarity certifications. 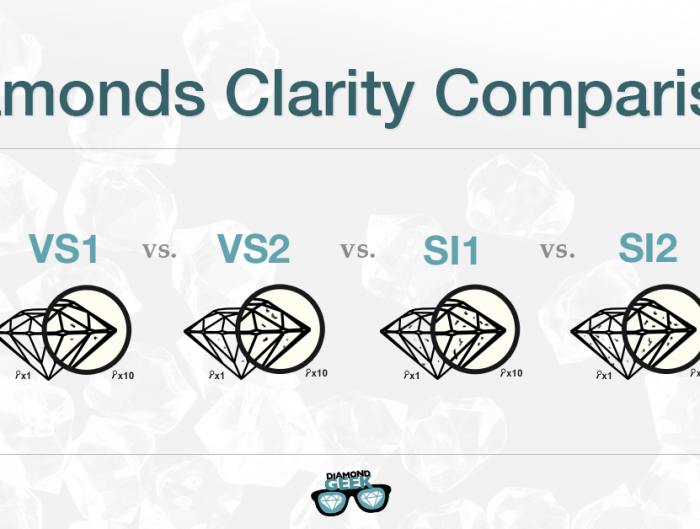 Why Choose an SI1 Clarity Diamond? 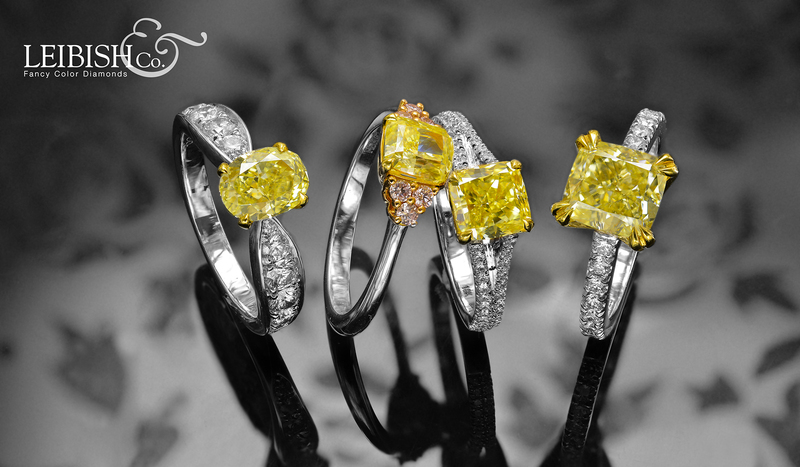 There is great value to be found in SI1 clarity diamonds. The GIA describes SI1 clarity as the existence of small internal flaws or inclusions that are only visible using a 10x magnifying loupe or other similar magnification. This means that in real world terms, these flaws will not be noticeable to the naked eye. To all intents and purposes, your diamond will look incredible and the flaws can be viewed on a positive light: they actually allow you to own such a great diamond because they reduce the value. Where to Shop for SI1 Clarity Diamonds? 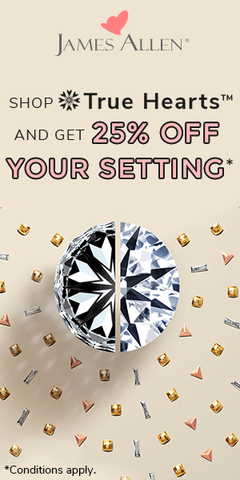 We’re lucky that today there are some many shopping options for diamonds. You can purchase your diamond from a local jewelry store, a large well-known jewelry store, a department store or even a pawn shop. More recently we have an influx of online diamond stores. Find a reputable diamond store that specializes in high-quality diamonds and you’ll have access to a wealth of choices. Shopping for SI1 clarity diamonds online has made finding and completing the purchase of diamonds so much easier. Physical stores have limited diamond options and the cost of maintaining a brick and mortar store gets added onto the price of the diamond. Online stores offer wider variety, better value and the better websites also offer detailed magnification photos of each diamond, so you can get a good look at your diamond before you make your decision. Online shopping is helping diamond buyers find the perfect diamond. Very few diamonds are exactly alike. 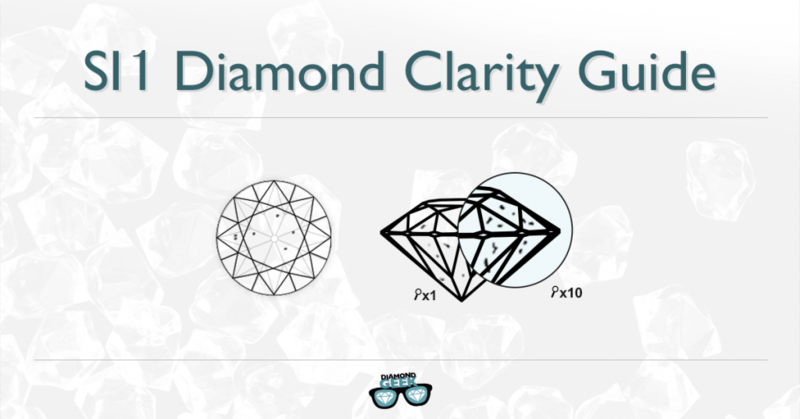 You will find diamonds with the same GIA clarity grade that actually have significant differences. These differences will decide whether you find a good deal or a great deal. 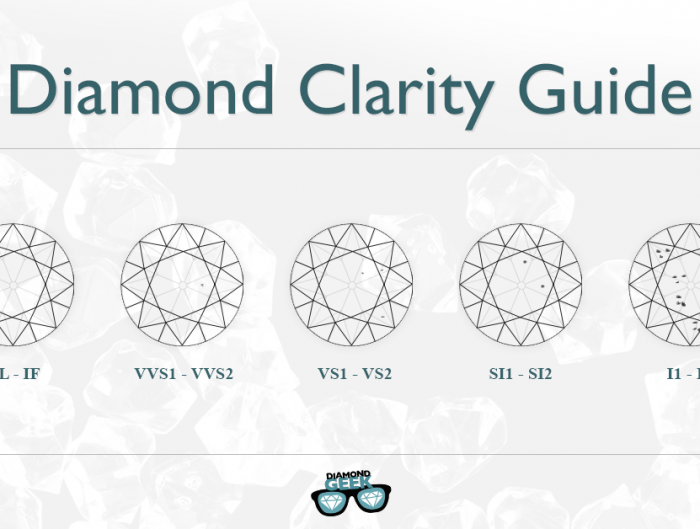 While SI1 diamonds all contain inclusions, there are three major factors that determine just how much these flaws actually affect the quality of the diamond. – The location of the inclusions in the diamond. – The size of the inclusions. – The color of the inclusions. The secret to finding the best SI1 clarity diamonds is to look for a stone with very small inclusions that match the diamond’s color and are located away from the center of the diamond. Below we have several examples of SI1 clarity diamonds, as graded by the GIA. As you can see, there are major differences between them. It’s true that none of the flaws below will be noticeable with the naked eye, so the real world experience won’t be diminished, however if you’re buying a diamond you’re still going to want to find the best diamond possible. The SI1 diamond images below are magnified by 40x. Finding a great SI1 diamond is a wonderful feeling and thanks to this guide and the amount of options available thanks to online stores, you will definitely be able to purchase a truly special diamond. If you are still unsure, by all means drop me a line. I love nothing more than helping people find perfect diamonds.